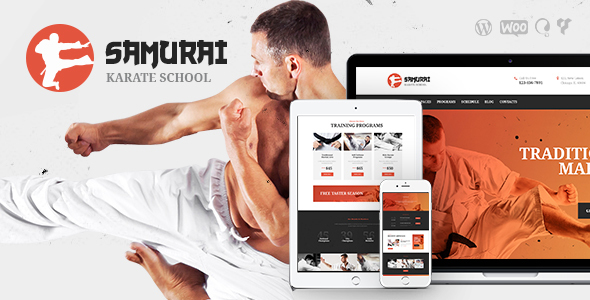 Samurai is a modern, clean, fresh & responsive Karate & Martial Arts WordPress Theme. It is designed for all kinds of contemporaryathletes, sportsman, trainers agency, sports coaches, runners company, sportsmen and all healthy lifestyle people. Also it fits bold & stylish blog, magazine, marathon runner, healthy lifestyle coach, fitness coach, jogging trainer or sportsmen health store. Samurai is perfect for martial arts like karate, wrestling, boxing, MMA, taekwondo, aikodo, mix fight. 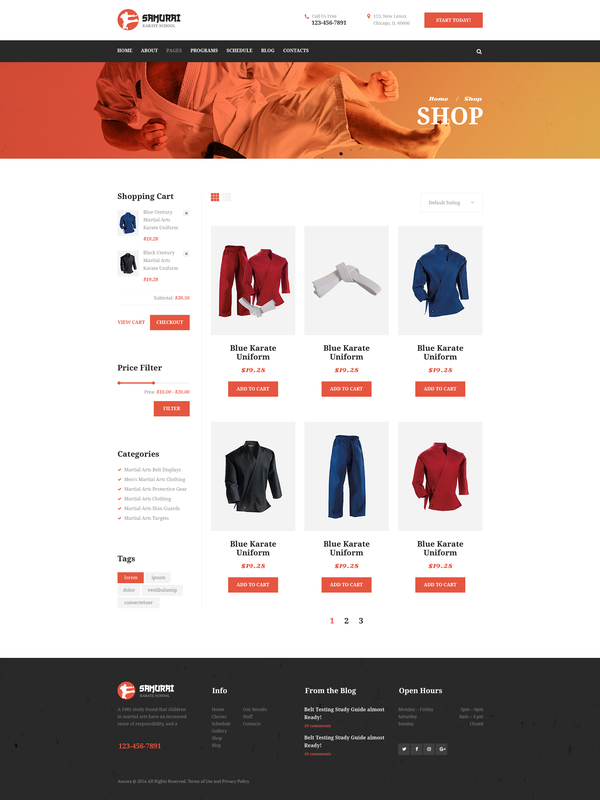 You can open WooCommerce online Store and sell sportswear, gear solutions, special equipment like running shoes services, accessories, and equipment business, player jerseys and t-shirts for everyone: amateur or professional, kids or adults, rookie or veteran. Samurai is made compatible with WPBakery Page Builder (aka Visual Composer, which we think is better than Elementor). With a lot of powerful features, Samurai will definitely satisfy your needs. The theme offers an easily manageable homepage layout that can be adjusted using shortcodes and custom widgets. Attractive galleries integrated due to Essential Grid allow you to showcase your products and services. Using the Events Calendar plugin you can inform your users about upcoming workshops and competitions. The theme is compatible with awesome plug-ins: Revolution Slider, Essential Grid, PO Composer, WPBakery Page Builder (for creating any layout at your taste). We made the theme fully responsive so it looks incredible on all mobile devices, from Android smartphone to Retina displays. Please be aware that we do not include Timetable Responsive Schedule For WordPress into the theme’s package. It is for demonstration purposes only. To use this plugin, you need to purchase it first.